French President Francois Hollande has urged for the US embargo on Cuba to be lifted, promising that Paris will do everything in its power to help put an end to more than five decades of sanctions against Havana. “The measures that have so badly harmed Cuba's development can finally be lifted, repealed… This is what has to be done,” Hollande said at Havana University during his landmark visit to the Communist island state. “Anything France can do to make sure” the sanctions are removed will be done by Paris, he promised. Hollande has become the first EU leader to arrive in Cuba after Havana and Washington announced plans normalize relations this December. “The opportunities are now opening for Cuba to finally receive a chance for unrestricted exchange with the rest of the world,” the president is cited by French BFM TV channel as saying. He stated that “France has always opposed the embargo, which hampered Cuba’s development,” and the country voted against the continuation of sanctions in the UN on a regular basis. Hollande arrived in Havana on Sunday in the hope of to normalizing European-Cuban relations after decades of harsh US-driven economic sanctions against the communist island. Hollande, the first French president to visit Cuba since the island nation gained independence in 1898, was greeted Monday morning at Havana's Jose Marti International Airport by Cuba's deputy foreign minister, Rogelio Sierra. "I come to Cuba with great emotion because it is the first time that a president of the French Republic has come to Cuba," Hollande said on arrival. Hollande, on a whirlwind five-day tour of the Caribbean, paid tribute to the historic ties between France and Cuba. "There are historic ties, deep ties, between the people of France and the people of Cuba," he said, as quoted by AFP. "Cuba wants to move on to a new phase, a new period, a new time for this island that was victim of an embargo," Hollande told reporters in Guadeloupe before his departure to Havana. The French president, who is suffering from dismal public opinion polls back home, has already paid visits to Saint-Barthelemy, Saint-Martin and Martinique. Following his one-day visit in Havana, Hollande will wrap up his Caribbean tour in Haiti on Tuesday. France, which hopes for economic opportunities from Cuba in the future, is seeking to "be the first among European nations, and the first among Western nations, to be able to say to the Cubans that we will be at their side if they decide themselves to take needed steps toward opening up," he said. The French leader was realistic about the situation in Cuba, where economic barriers remain stubbornly in place following many years of embargo. Trade between France and Cuba is worth around $388 million a year. 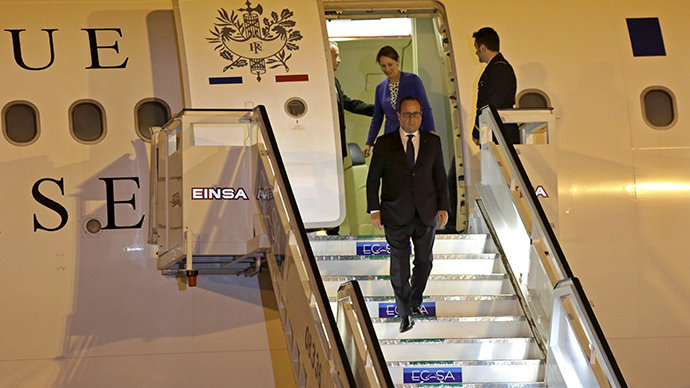 "There are still a lot of measures in place that block trade and business," Hollande admitted. Aside from breaking the political ice that has formed between Europe and Cuba, Hollande is hoping to help French companies gain access to potentially lucrative Latin American markets. Hollande is scheduled on Monday to meet with Cuban President Raul Castro. The two leaders last met in December 2013 in South Africa at Nelson Mandela's funeral. Hollande will also visit Fidel Castro’s home on Monday for a meeting with the 88-year-old father of Cuban revolution, AFP reported. Relations between the European Union and Cuba broke down in 2003 following Havana’s tough stance against journalists and activists. Hollande pledged not to avoid such issues during his visit. "I speak of human rights whenever there are political prisoners, every time there are violations of freedom, France does not remain tight-lipped," he said prior to his arrival. Monday’s visit is just the latest effort by Paris to cement Europe's rapprochement with Cuba. French Foreign Minister Laurent Fabius paid a visit to Cuba in April 2014.